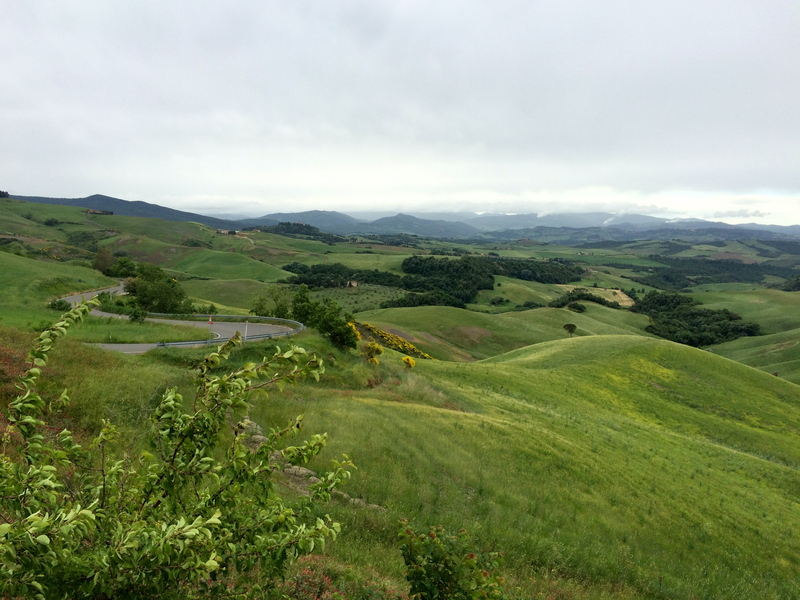 We Roam Tuscany and Umbria | Sprezzatura, Y'all! David and Edith wanted to travel through the Chianti country (for good reason – it’s unbelievably beautiful) and go to Assisi. Being the good hosts and tour guides that we are, we obliged them. These are two of our favorite places and both are a very manageable day trip from Anghiari. Chianti is everything you would imagine it to be. Winding roads that wrap around hills providing one spectacular view after another. 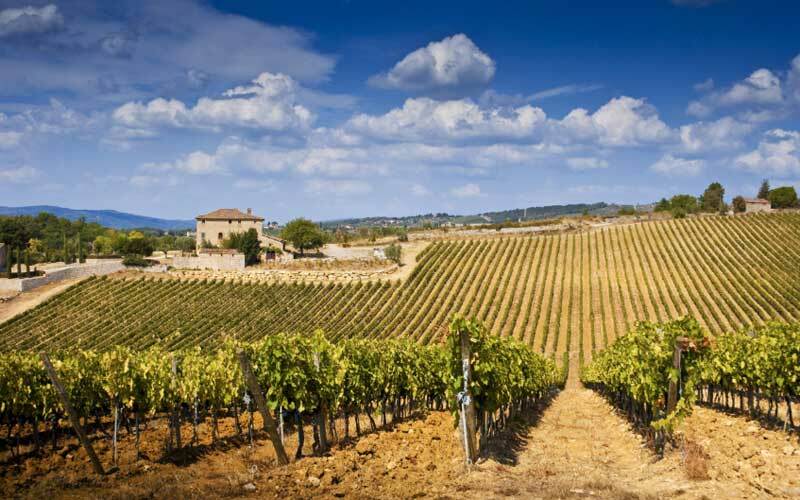 Vineyards, olive groves, castles, wineries – Chianti has it all. There are only a few major towns in Chianti – Greve, Castelinna, and Radda. We saw them all. Some of them we saw a lot. The first day we went through Chianti the weather was terrible. It was rainy and overcast and sometimes the rain was very heavy. Really not ideal to drive through such beautiful scenery. Honestly, though, the clouds and rain lent an ethereal quality to the landscape. I’m sure David, who did all the driving, might not agree with this. Those roads are tough to drive on anyway with all the hairpin curves and steep ascents and descents, but throw in some downpours and it can become downright treacherous. But he did a great job (thanks, David!). The very observant reader may have picked up on my earlier comment about the first day we went through Chianti. This implies that we went more than once. Let me explain. During our first trip there, through the rain, one of us lost something very valuable. When it was discovered this valuable item was missing, we retraced our path and undertook a massive search, trying to remember where we had been, where we had stopped, where it may have been left, where it may have fallen out. We didn’t find it and the day took on a very somber tone as we realized that this item and all its contents was gone forever. Once back at the apartment, we had the grim task of taking inventory of what was lost and calling to cancel credit cards, remembering the family photos that could never be replaced, the driver’s license that is critical for driving here. The next morning dawned clear and bright, and brought with it a miraculous email. The item had been found by a group of children and they turned it into their priest, who in turn brought it to a hotel in town thinking its owner might have been a guest there. A business card inside it provided an email address that the hotel used to contact us and let us know that they had the item safe and sound and we could retrieve it when possible. So many things about this story are wonderful and inspiring. Everything about it was right – good children who did the right thing, a kind priest who went out of his way to try and help, a hotel employee (who fortunately spoke perfect English) who found the business card and contacted us. And we got to go back through Chianti in the beautiful sunshine with not one cloud in the sky and see it from an entirely different perspective. 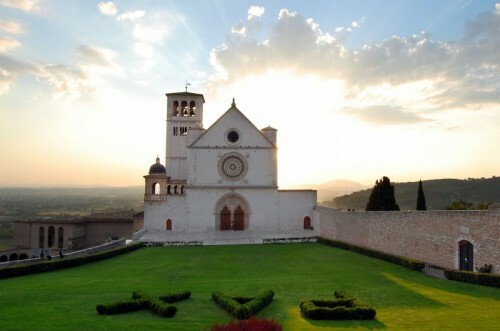 Assisi. What a beautiful place. Especially after about 4:30 when most of the tour buses that come in for the day have cleared out. 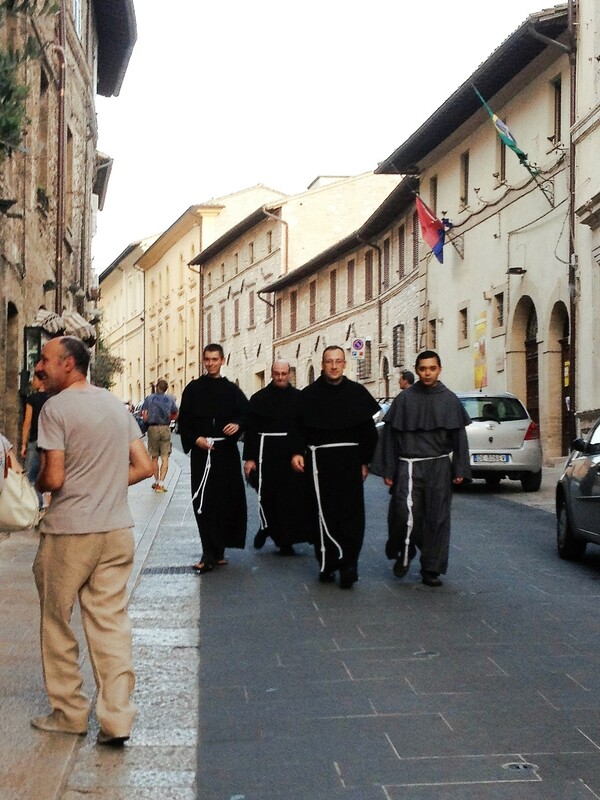 St. Francis of Assisi is the main reason most people visit Assisi. And for good reason. He was, by all accounts, one cool dude. The basilica is named for him, but was built long after he was around. 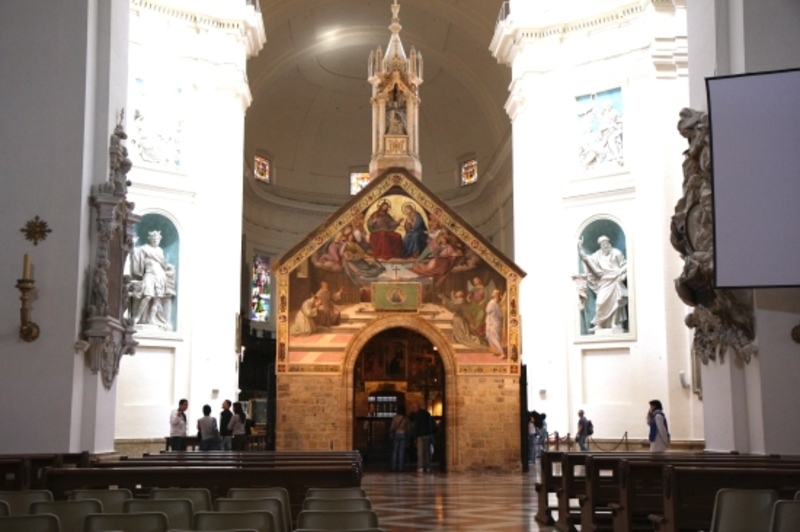 One of the most interesting things in Assisi to me is the church of Santa Maria degli Angeli, or as I like to call it, the church within a church. The large, new (started in 1569) church was built around the small chapel, called the Porziuncola, where St. Francis started the Franciscan order. It was also where St. Clare began her monastic life. 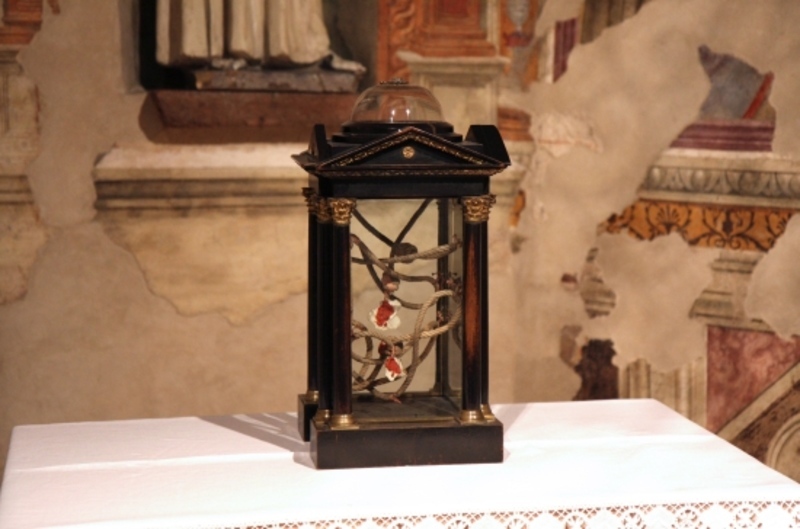 Also inside the big church is the place where St. Francis died and the ropes he used for his belt. There’s also a rose garden, all that’s remaining of the forest where St. Francis and the friars lived. The story goes that St. Francis threw himself into the rose bushes naked to combat doubt and temptation. After contact with his body, the rose bushes lost their thorns. And today they continue to grow, thornless, as a testament to St. Francis, the cool dude. The Basilica is also very impressive. It’s where St. Francis is buried and is a glorious shrine to him. I had Millie the dog, and despite the fact that St. Francis was a lover of animals, dogs are not allowed inside the Basilica. Besides the granduer that is the Basilica, (I wonder what St. Francis would have thought of all that) Assisi is quite a wonderful town. 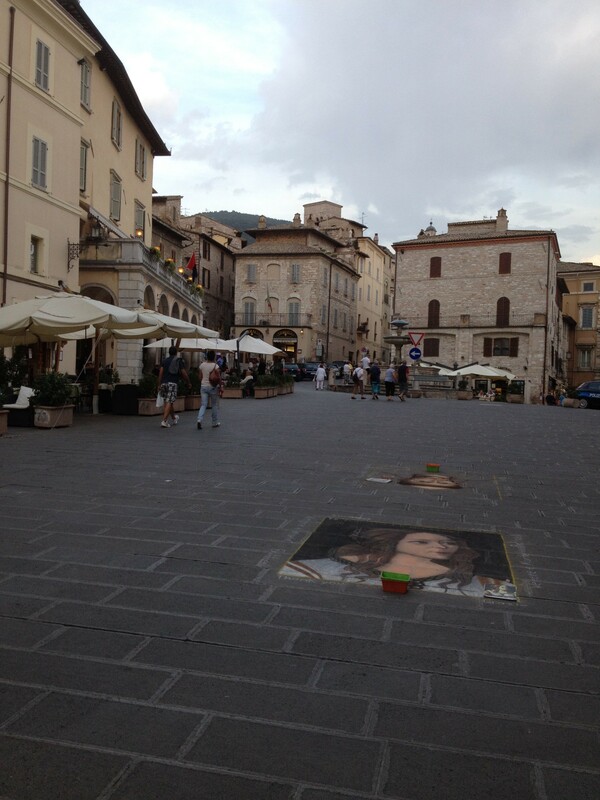 After all the St. Francis sights, it’s a little hard to concentrate on anything else, but there’s a lot to see in Assisi. It’s just that most people don’t have the time or inclination to do it. We took a pretty good tour around town before the rain came and dampened our visit. But we were tired and hungry at that point and ready to go back to Anghiari where we had pizza on the piazza and talked extensively about Jo-Jo the wonder dog, smartest dog in the world. You had to be there. We love happy endings — yay! Great photos, Cathy!